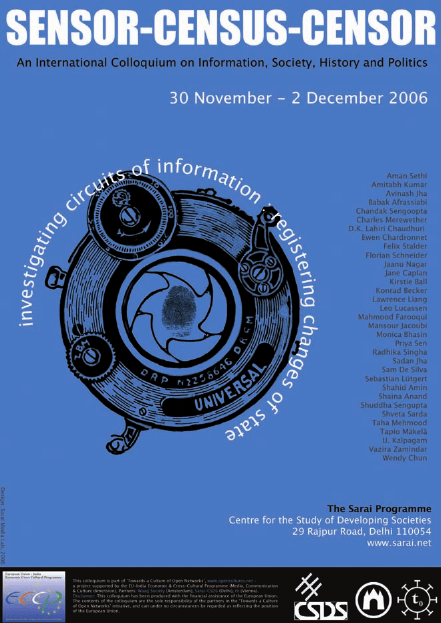 Though the roles and functions of the census, the sensor and the censor have somewhat diverged in more recent times, (with the census by and large escaping the moral censure that sensors and censors often receive from those concerned about civil liberties), their fundamental convergence at the root level of information control remains evident to even a superficial scutiny of information processes in society. Sensor-Census-Sensor: Investigating Circuits of Information, Registering Changes of State colloquium was produced and designed at the Media Lab, The Sarai Programme, CSDS, as part of Towards a Culture of Open Networks, a collaborative initiative of The Sarai Programme, Waag Society, and t0. The initiative was supported by the EU-India Economic and Cross-Cultural Programme under its Media, Communication and Culture Dimension. Production and Operations Management: Ashish Mahajan. Assisted by Aarti Sethi, Aftab Alam, Iram Ghufran, Lokesh, Moslem Quraishy, Sachin Kumar, and Vikas Chaurasia. Audio Recording: Bhagwati Prasad and Ish Sherawat. Disclaimer: This document has been produced with the financial assistance of the European Union. The contents of this document are the sole responsibility of the partners in the Towards A Culture Of Open Networks initiative, and can under no circumstances be regarded as reflecting the position of the European Union. The entire report can be accessed and downloaded from the Sarai archive.